When the kids were little, they categorized the day's weather in March as a "Lion Day" or a "Lamb Day". Windy days are always the norm here on the prairie, but today we have an official wind advisory with gusts as high as 50 mph. That qualifies today as a "Lion Day". I tried to capture the wind's effect on these pine boughs in our neighbor's yard. We are on the lookout for missing roof shingles and torn siding. And there's that yellow sandbox cover that blew into our yard. It's not unusual to see a random trampoline in the area lakes following high winds - that's what we tell the kids when they ask why they can't have a trampoline. WOW that's windy. I know an hour from me they had winds at 91mph just a bit ago. But that was when the tornado was coming through. I won't mention it to your kids, but our trampoline is secured into the ground with cables that are 2-3feet deep and don't pull up... It didn't go anywhere today (although the slide came off the playset). Wow--great shot! You can just feel the wind with this. Nice capture!! We get high winds here coming through the mountain passes. We've had gusts up to 90 MPH out here. Kinda scary when you have teh 100'-plus trees around the house. Wow...neat capture! We get windy days in March a lot too. Wow, that is a lot of wind, and it really shows in your shot! Wow, that's windy!! I love how they are lion or lamb days! Sorry for the horrible wind, but it did provide you with a great photo! I hope you don't have any damage. Ooh, sorry to hear about the wind, but that is really a great capture of it. Great shot---I can feel the wind in my face! wow that sure is windy! 50 mph is crazy! Nice shot of the blowing tree. WOWSERS that is some wind! 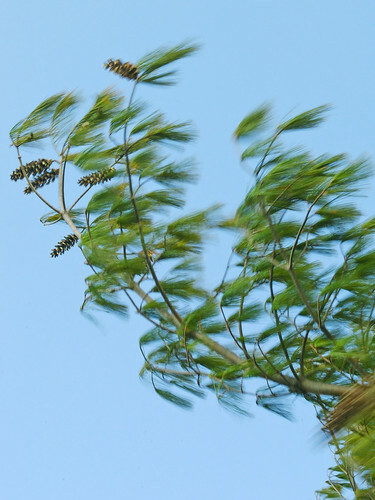 Love this shot, that slight bit of motion blur is really effective at showing how hard the wind really is blowing! Wow - that is some wind!!! We're having some wondy days too! Cool shot! Impressive wind photo! I think we're getting that wind now, with some white stuff :( Definitely a "lion" day.